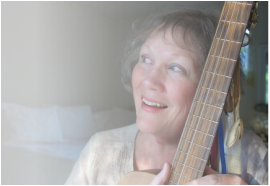 MaryLee Sunseri is the producer / arranger / performer of 16 CD’s of traditional and original music. Her credits include appearing in the MGM Elvis Presley movie The Trouble With Girls, recording nursery rhymes for Mattel Toys' See 'N Say, touring America as a member of “Randy Sparks & The Back Porch Majority,” recording the title song to Walt Disney’s movie The Apple Dumpling Gang, singing back-up for Shirley Jones, opening act for Bill Cosby and Lily Tomlin, and many concert appearances with the legendary Burl Ives. She received her certificate of study in Musical Theatre from London Drama School with distinction in singing. She performs many concerts for festivals, folk clubs, and corporate and academic groups annually. Ms. Sunseri is a frequent performer at public schools and libraries throughout California, Massachusetts, Washington and Cork County, Ireland.